Available on Amazon and Barnes & Noble as well as local and online bookstores; also at events. Released in 2013 by Llewellyn. Your Inner Gold presents the conjunction of opposites toward a consciousness of unity, the recognition of fear as the root of all suffering individually and globally as the most powerful deterrent to unity, the transformation of victimization, the power of allowing old ways of being and beliefs to die, the discovery of authenticity, sacrifice in the spiritual process, and the transformation of the ego-bound state.Pre-lifetime choices for the upcoming life illustrates how difficult persons or situations may have actually been chosen by our Souls to help us evolve. Two intensive processes are included: “The Gold Within You”, which creates awareness of the ego’s influence and how we can transform it; and “Writing a New Job Description”, an intriguing new way to release the ego from its old defenses and to create new ways it can assist us. 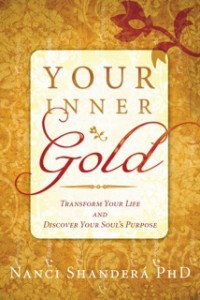 Your Inner Gold introduces seven basic stages of alchemical transformation as a model for personal transformation. Your Inner Gold offers ways to develop an active and healthy participation with the shadow, which contains all that we reject, deny, and judge in ourselves and others, even our gifts and talents. 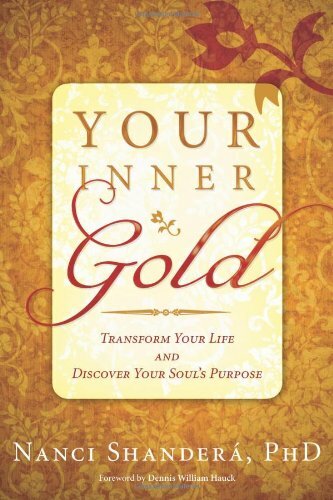 Your Inner Gold illustrates how to develop alternate perceptions of adversity, so guilt, repression, shame, difficult behaviors and beliefs, and fear can be seen as having a deeper function as tempering agents and experience builders that are directed by the Soul and its purpose. Your Inner Gold provides ways to open the heart to love and compassion for self and others and develop a belief in true unification with Spirit. “This book is a very useful guide and consistent encouragement for people to look beyond their ego-identified selves, to the potential for freedom and a greater identification with the divine. There are many examples of openings to higher understanding and great exercises to tweak the reader’s thinking out of the box. Dr. Shanderá has written openly and generously about this process and is navigating a complicated and interesting road – both assimilating others’ work and deepening a theory for understanding Soul. The reader will find permission to accept the human self with its bumps and bruises, while exploring and finding the true spiritual self.” Valerie Kack, Ph.D. in Women’s Spirituality, Psychotherapist, artist, and author of The Emotion Handbook for the Recovery and Management of Feelings and For She Is the Tree of Life: Grandmothers Through the Eyes of Women Writers.